Perfect way to propose to your bridesmaids! 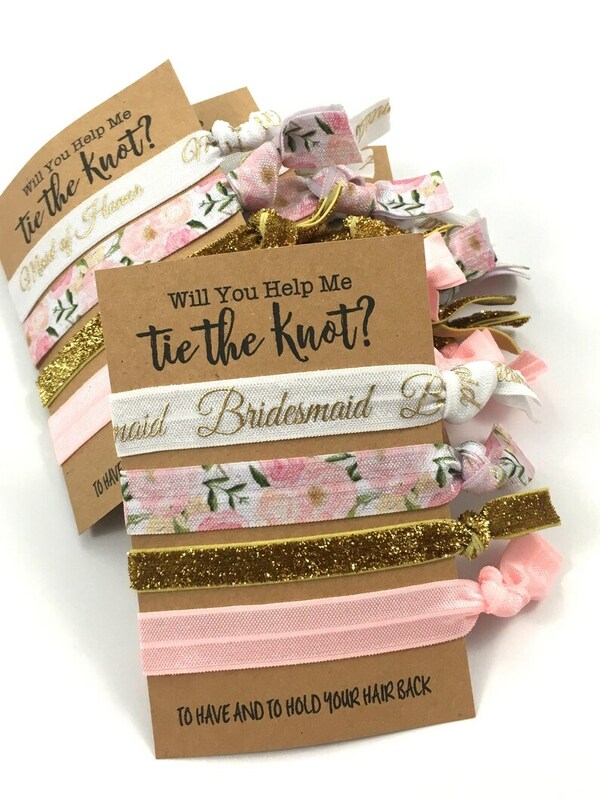 Ask or thank your favorite ladies for helping you "Tie The Knot" with these hair tie cards! This set includes 4 beautiful hair ties! If you want to swap out a solid color, it must be for another solid color. If you would like all four ties to be printed or glitter, message me for pricing info! Custom sets can be made, take a look at all of the other hair tie sets for the current prints/colors and send me a message! 1 | Select your saying from the 1st drop down menu. Reference third photo. "Thank you for helping me tie the knot!" "To Have and To Hold Your Hair Back"
3 | Select the amount of sets you would like from the 3rd drop down menu. 4 | Please specify the breakdown of the "titles" in the notes at checkout. NOTE: If no note is on the order, all bridesmaid titles will be sent. Or, leave a note at checkout to swap out the title tie for a matching print. The elastic is pre-printed we can't customize the wording, sorry! The girls loved them!! 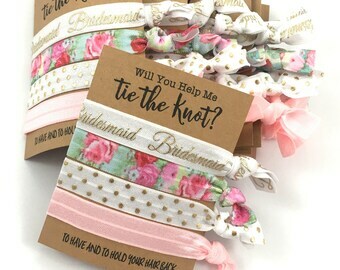 The hair ties are great quality and super cute. It was a little harder to present them since the cardstock is thin & curls, but it was a minor detail. Overall, a great gift!